I accomplished a first in 2015 – finishing 100 books. Most years, I read about 65. A few times I’ve topped out near 85, but this year I actually hit three digits. To see the books and some cool stats about them, goodreads puts together a nice year-end summary. Or, for a quick list, divided by books I physically read vs those I listened to, I keep a running list on this site. But that’s not really what this post is about. People often ask me for book recommendations, so this post is about the books I read in 2015 that I’d recommend to others. I reviewed it (click on the title) so I won’t discuss again, but this was over-all, the best book I read this year. I actually read it twice, rereading it for my book club’s selection and discussion. It isn’t for the faint of heart. I often tell people when I’m recommending it that it is better than Unbroken (from a literary standpoint) but just as difficult – if not more so – to read. This book deserves a better review than what I’m going to give, but in short, it chronicles the days leading up to and after Katrina hit the Gulf, causing massive flooding in New Orleans. The flooding, in turn, caused the power to fail at Memorial Medical Center and chaos to ensue. High acuity patients from another facility had been temporarily relocated to Memorial ahead of the storm. Many community members and staff family members considered the hospital a place of refuge during weather events. Finally, conflicting priorities and opinions around chain of command as well as lack of clear governance and communications led to flailing accountability and responsibility. In the end, Memorial Medical Center had a higher than normal death rate for patients during the storm and one doctor stood accused of contributing to the premature death of some patients. Journalist Sheri Fink tells a riveting story with layers of contributing factors – including the history of how patients are triaged in healthcare and the years of neglect hospital systems suffered under tight budget controls – that created this perfect storm, the one inside the hospital. A must-read for anyone in the healthcare field, but a fascinating one for lay people as well. And must I say it? A great book club discussion. I first read Donna Tartt’s best seller in my early twenties. At that time, I was fresh out of my own idealized liberal arts, English major years and so easily became consumed with the elitist circle that are the main characters. Twenty years later, the book is still as appealing, but for better reasons. Tartt’s characters are amazingly developed, the setting perfect and the narrative engrossing. The story is narrated by Richard, a lower-class scholarship student who never feels on par to his fellow classical classmates. In addition to his social economic status, the other group members have a life outside of school that Richard hasn’t completely been included in. When one of these secret escapades ends with an accidental death, it seems the only reasonable solution is to do away with the one of their own who is putting them at risk. 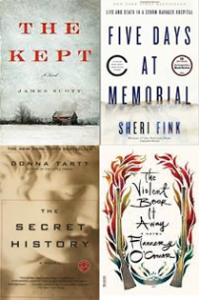 Full of pride and tragedy, The Secret History may best be described as a Greek psychological thriller. It is no secret that I love Flannery O’Connor, and so adoring this novella was no surprise either. While it isn’t a long or difficult read, my best advice is to make ample room for reading as much literary criticism as you can to help broaden the reading experience. Steeped in religion, a reader must reconcile what is known of Flannery’s personal beliefs and dig deep to get at the meaning of characters, themes and symbolism of this work. The Violent Bear it Away calls for thoughtful discussion, so it also makes a great book club read. Every now and then I am caught off guard by a book I know little of and am swept away. Such was the case with The Kept. I checked it out on my Kindle from my local library – so basically read it because it was available. But this book got me at the outset and never let me go. Set in 1897 upstate New York, Elspeth, a traveling mid-wife, comes home to find her whole family, save one son, Caleb, murdered. He’s camped out in the barn and in a nervous impulse shoots his mom thinking she is the band of murders returned. Once Caleb has nursed Elspeth to a traveling state, they take off to track the guilty party. Along the way, the dark origins of their own family emerge. This is as somber and melancholy a read as it sounds, but it is also drips with suspense due to memorable characters, authentic setting and measured narrative. I couldn’t put it down. If you decide to pick any of these up, let me know. And, let me know what your favorite books were from 2015.